Health insurers are recognizing the growing demand for dual-eligible special needs plans, or D-SNPs, and the associated opportunity. D-SNPs are for seniors who qualify for both Medicare and Medicaid. Since 2011, D-SNP enrollment has doubled and currently exceeds 2.2 million beneficiaries, according to MedPac. Additionally, The Gorman Health Group predicts the D-SNP market will double again, exceeding 5 million, by 2021. Leading insurers in the D-SNP market should be familiar to Medicare marketers: UnitedHealthcare, Humana, and Anthem. UnitedHealthcare, in particular, is making a strong D-SNP push, launching plans in six new states last year and growing its D-SNP business by over 33% in 2018, according to AIS Health. Based on our industry insights and with some help* from Mintel, we took a look at some of the direct marketing tactics used by each of these insurers to promote their D-SNPs and found many similarities, and a few differences. 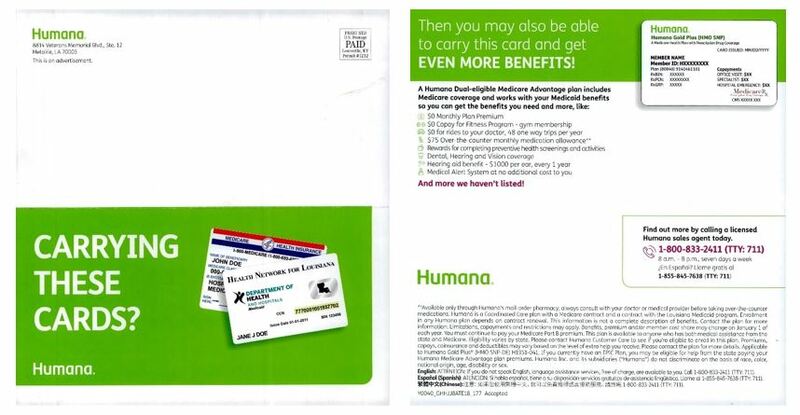 In the self-mailer below, Humana uses a large image of Medicare and Medicaid cards, as well as an all-caps headline which reads “Carrying these cards?”, for a simple and straightforward (and commonly used) approach, which allows recipients to self-qualify. Continuing on the back, the copy highlights the potential to get “even more benefits,” and then lists various plan benefits, starting with the $0 monthly premium, followed by aspects that are meaningful to the dual-eligible population, like “$0 for rides to your doctor,” a “monthly medication allowance,” and “dental, hearing and vision coverage.” The piece only has one call-to-action (CTA), a phone number – no BRC or URL to learn more about the plan. Anthem BlueCross uses an all-in approach in the below upgrade/retention letter package to Medicaid members that are turning 65. In their messaging, they use first name variable fields to personalize their direct mail pieces while also emphasizing urgency by printing “Call before January” on both the outer envelope and letter. Like Humana, they feature images of Medicare + Medicaid cards, and they also show an image of Seniors. Additionally, they offer multiple CTA’s and response options – call, online, in-person or BRC. Their list of benefits shows on pages 1 and 2 (with some benefits repeated), emphasizing their message of “extra benefits you deserve.” They also provide a 4.5-star rating insert, emphasizing the quality of their Medicare Advantage Plan and why this should matter to consumers. Obviously, a multi-page letter package will include more content than a self-mailer. Anthem Blue Cross takes advantage of the additional real estate by going all-in with more graphics, information, and CTA options. Given the audience, it would be interesting to compare the response rates of this piece with a more simplified mailer. Regardless, Anthem BlueCross is smart to target their existing Medicaid members as they become dual-eligible. UnitedHealthcare has found a middle-ground with their D-SNP marketing – combining the simplicity of Humana with the additional information and response options of Anthem. 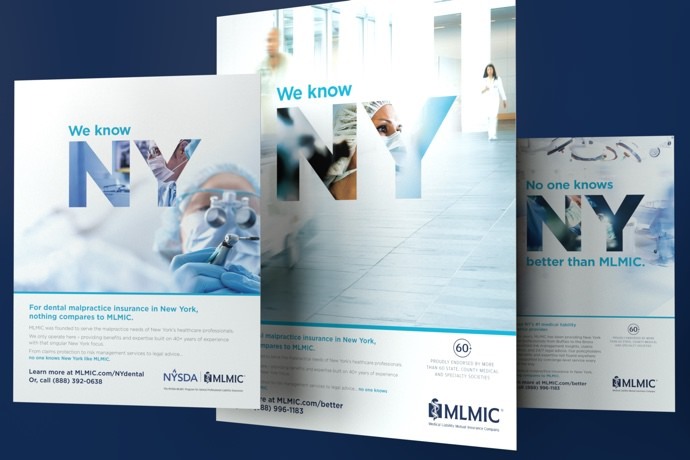 Two of UnitedHealthcare’s D-SNP direct mail pieces are featured below, both delivering a similar message of “Get more” using large and uncomplicated headlines, graphics and icons that make the pieces easy to comprehend by scanning. 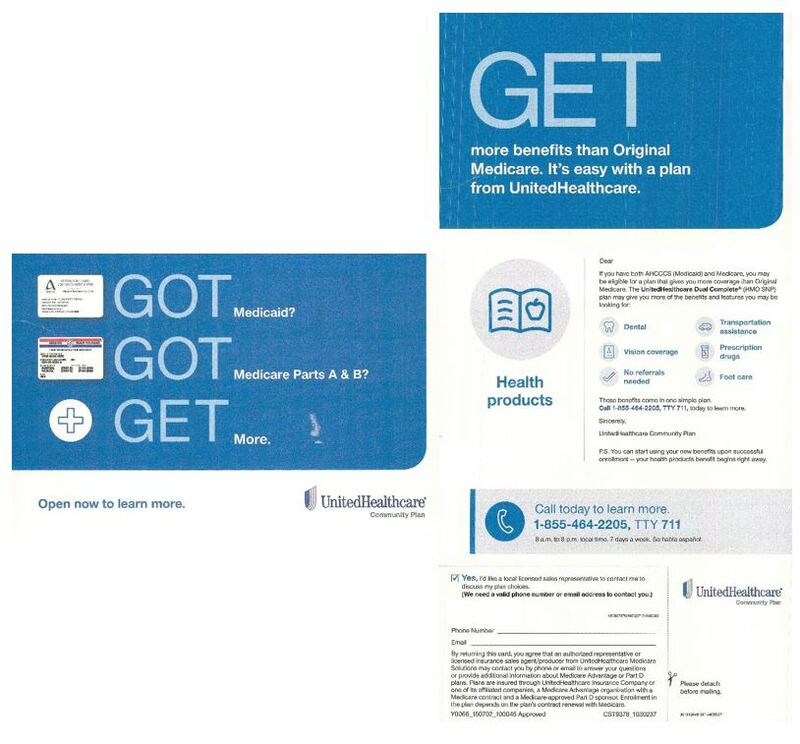 As was prevalent in both the Humana and Anthem pieces, the Medicare and Medicaid cards are shown in one of the UnitedHealthcare mailers, while benefits that are meaningful to the dual population are in bold, blue font (with additional details provided in example 1). Both direct mail pieces offer responses via business reply card (BRC) and phone, while example 1 also offers a website URL. UnitedHealthcare uses DRTV as well to connect with the dual population. In the below two-minute spot, the insurer promotes its years of experience while educating the viewer on both the benefits and low cost of its D-SNP offering (as well as the concept of a D-SNP itself). 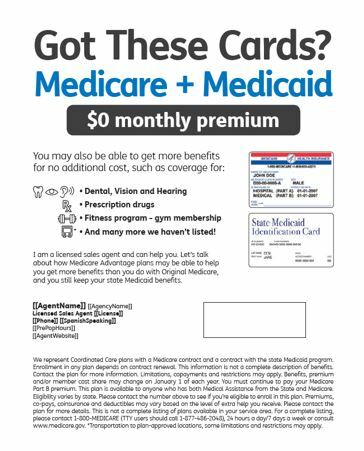 Many of the key messages in the spot are the same as those in their direct mailers (i.e., the Medicare/Medicaid cards, relevant benefits, etc.). However, they also use the audio/visual medium to further explain unique benefits, such as the credits members can use to shop for items in the UnitedHealthcare Health Products Catalog. 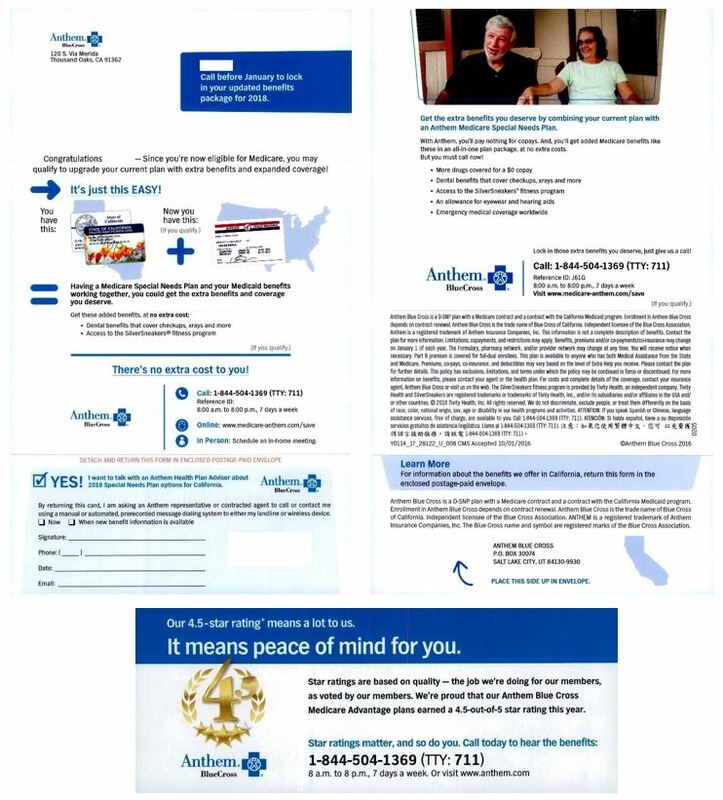 The D-SNP marketing samples above provide a glimpse at direct mail, broker/agent, and DRTV tactics used by top insurers to attract the dual population. It’s important to note that in order to maximize results, an integrated, multi-pronged marketing campaign is necessary. 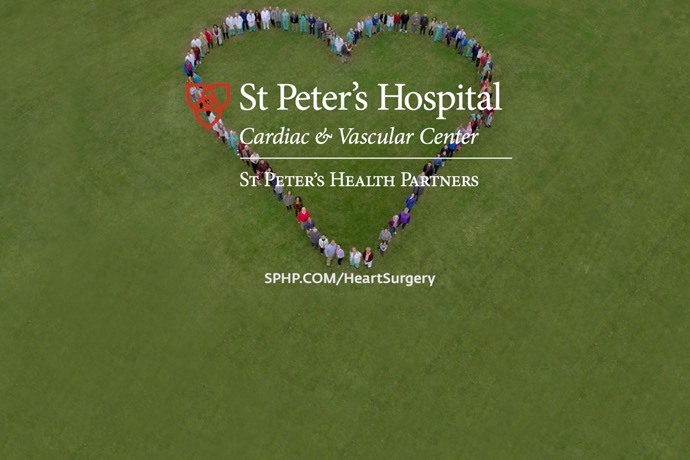 In particular, grassroots and community-related marketing efforts are key ways to connect with this audience, as noted in FierceHealthcare by the SVP of marketing for SCAN Health Plan. We expect continued growth in the enrollment and number of dual-eligible special needs plans available, especially since the Bipartisan Budget Act of 2018 made SNPs permanent, according to MedPac. If you’re an insurer looking to launch (or grow) a D-SNP plan, let’s connect. Contact Jim McDonald, Director of Business Development at 518-456-3015. *Direct mail communications (screenshots) sourced from Mintel – a world-leading market intelligence agency. In order to optimize Medicare marketing budgets, it is important to understand ever-changing senior media preferences and habits. To help healthcare marketers keep tabs on the current trends we surveyed over 400 men and women aged 64 and older on their media habits. New CMS rules allow Medicare Advantage plans to add supplemental benefits. This offers innovative health plans the opportunity to introduce new and compelling features... and gives healthcare marketers the chance to effectively promote them. 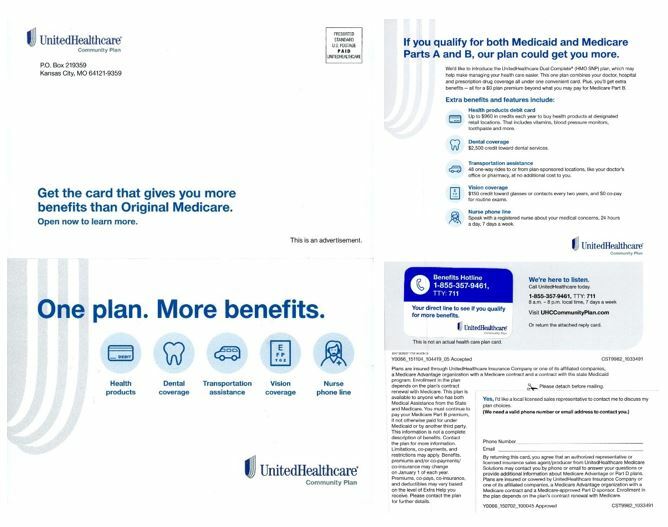 In reviewing direct mail and print marketing tactics used by insurers with this year’s biggest Medicare Advantage enrollment gains, we noticed a continuation of common themes from previous years and a few new highlights.